In the last half-year of her PhD, Dr. Heather birthed her first child, completed and defended her dissertation, and landed a tenure-track job… all while caring for her infant alongside her visiting professor husband without any outside help. During the episode, we discuss many of the logistics that go into having a child during grad school, from arranging parental leave to conducting experiments around a nursing schedule. Heather shares how she learned to ask for the accommodations she needed and her advice for new academic parents. Dr. Heather works at a small undergraduate institution in the Midwest U.S. She and her husband both work as professors. She has a PhD in Chemical Engineering in the southeast U.S. Her husband’s background is in math and computer science. They had her first child while Heather was finishing her PhD and on the job market. Heather was four years and one semester into her PhD when she had her baby. Her husband was a visiting assistant professor at the institution where she was getting her PhD. Both of them were looking for tenure track positions while Heather was pregnant. They found jobs at the same institution, and have been in their current position for four years. They had a second child and are expecting their third. They value commitment to family, so they don’t let their professional life deter them. Their jobs and finances are in services to their values. 5:10 What was your income when your first child was born? In total, they earned around $60,000 per year from their primary jobs. Because her husband had a visiting assistant professor position, her husband’s salary was around $40,000 per year. Heather’s income was around $18,000 per year. In addition, they both had earned income from summer internships in private industry. They each made $16,000 to $18,000 for three months of work. Much of this money remained in their accounts at the time their daughter was born at the end of the calendar year. Their household income was lower the next year, because Heather took unpaid leave after having her baby and neither took another summer job for extra income. 8:55 How did you arrange your parental leave? Heather did not find a formal university policy on parental leave for any type of employee, whether tenured faculty or staff or graduate research assistant. Without a university policy to go by, Heather looked to the Family and Medical Leave Act (FMLA) that guaranteed she would get her job back if she took off six weeks unpaid. She was paid by her research advisor’s grant, so she came to an agreement directly with her research advisor to take six weeks unpaid. Because she gave birth during winter break, Heather had two weeks break in addition to six weeks unpaid, for a total of eight weeks off. Nevertheless, when her baby was one month old, Heather returned to work in the lab one hour each day. At six weeks, Heather worked four hours in the lab and worked on writing manuscripts. She did not work a typical 40 hour work week. Some weeks she’d work 12 to 30 hours, and others she’d work more than 50 hours on writing her dissertation. She had set her defense date, so she felt that her own progress was at stake if she delayed returning to work. 14:58 Did your partner take parental leave? Heather’s husband did not take any official parental leave. He was teaching three courses in the fall while Heather was pregnant. During the spring, When they had their newborn child, he was teaching three courses. He had two or three afternoons each week when he was teaching class. However, he had every morning of the week unscheduled and two days a week unscheduled. Heather was able to work in the lab in the mornings while her husband stayed with the baby. Two days a week, Heather had the option of working a full day in the lab. 16:20 How did you use your health insurance? Heather remembers she had the option to add her baby to her health insurance or to her husband’s health insurance. She had out-of-pocket costs and co-pays. In one case, she chose a medication that was significantly cheaper. Overall, she did not feel overwhelmed by the financial stress, but she found it confusing to plan for medical expenses. She used her savings from her summer internship to cover prenatal care. 21:39 What was your childcare arrangement and how was it different than other approaches? Her husband’s schedule was fixed with class times, but Heather’s schedule was very flexible. They considered the baby’s needs and developed routines around the baby’s sleeping and feeding schedule. Heather would leave the house at 6am and try to be home by 10am because the baby consistently slept for this four hour time block. She used this plan to get her lab work done. Once the baby could use a bottle, Heather started to extend her time away from the baby and get more work done in the lab. Heather and her husband were primary caretakers of their baby. Even after the first four to six weeks, they did not put their child in daycare or have other outside help. 25:20 How did the childcare arrangement change when the baby was older? At the end of the spring semester, Heather’s baby was five to six months old. This was a stressful time for Heather and her husband. They set morning time to be “baby with dad,” and afternoon time was “baby with mom.” However, there were times when Heather’s husband would call to ask her to come home to help calm down the baby. Heather felt that if she kept pushing lab work off until the next day, she would not finish by her defense date. During the summer, Heather’s baby was six to eight months old. Heather switched her focused to writing her dissertation, and stopped doing lab work. Heather’s husband did not teach during the summer, so he took the leading role to care for the baby. They approached childcare as a team. 28:05 What was your motivation to take on full childcare responsibilities? Heather and her husband were eager to learn to be parents. They felt that having a baby was an exciting challenge that they could take on together. They were excited to be part of the baby’s life as much as possible. By caring for the baby themselves, they learned how to care for an infant. They valued the learning experience and they were wiling to make sacrifices for it. They now look back on that time fondly. Heather and her husband had friends that also took on childcare while in graduate school. Seeing another graduate student parent couple made them hope they could do it too. When more people tell their stories of parenting while in graduate school, it helps others understand what it’s like to make this decision. Emily mentioned that in U.S. society, parental leave policies could be a deterrent to having a baby and detrimental to women. Because there is no mandate at the federal level, policies are inconsistent across the country. They often only allow for maternal leave and no paternal leave. Heather explained that she has an egalitarian relationship with her husband. They are a team, so it was their understanding that they’d take care of the baby together. They chose to balance childcare responsibilities in ways that made sense, not following gender norms. Heather and her husband both wanted to spend time with their kids. 35:02 What was your experience being on the job market with a baby? Heather was applying to jobs while she was pregnant. She applied to jobs with deadlines in November and early December, then planned to take a break after having her baby and apply to more in the spring if needed. Heather was worried about having job interviews when she was pregnant. 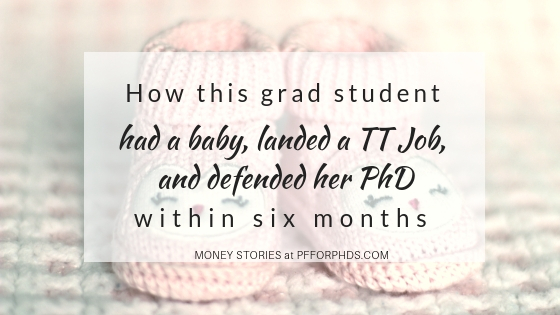 She sought advice from faculty who had also applied to jobs while they were pregnant. Heather was advised to tell her interviewers about her pregnancy, because the response would be a major indicator of her potential employer’s values. Heather found this advice to be very reassuring and useful. Heather got a job interview when she was 8 months pregnant. She couldn’t fly to do the interview in person. She told her point of contact that she was expecting a baby, and she received congratulations and willingness to accommodate. They arranged a remote interview with every person she needed to talk to, and she got the job. Heather wanted to visit the institution before she accepted the job, so they gave her extra time to make her decision. Her husband got an interview at the same institution, so they visited together with their baby in the winter. When her husband got his offer letter from the institution, they both accepted their positions. By choosing to disclose her pregnancy during the job application process, Heather had the power to reframe her pregnancy as a way to determine if the potential employer shares her values. In making her decision, Heather considered how family-friendly was her point of contact and the rest of the institution. Heather was accepted for the position at her top choice. She applied to a few and select positions, and coincidentally her top choice had an earlier timeline. Heather and her husband were also looking at industry jobs. 43:00 What advice do you have for other first time parents in the PhD process? How did you keep startup costs low? Heather advises to keep it simple. She said they asked for clothes and gift certificates. They did not want big items as hand me downs or gifts. Because they lived far away from family, they avoided inheriting too much stuff. They had no nursery and no changing table. They used cloth diapers instead of disposable diapers. Heather breastfed her baby, so they didn’t buy formula or lots of bottles. Babies need very little when they’re very young, so it’s easy to keep costs low and buy only the basics. Heather also says to surround yourself with people who have been through this before. She reached out to women who had babies in grad school. Also, she reached out to women in the community to get recommendations for doctors, caretakers, and prenatal classes. This is how she found what was available in the community. You also have to ask for what you need. For example, Heather was riding her bike to the only place on campus where she could pump. But when she asked for a private space in the building that she worked in, a space was arranged for her. She encourages young parents to get the confidence to ask questions and get information. Kind of like talking about finances, talking about parenting can feel taboo, but so many people have similar experiences and knowledge to share. Heather was considering if graduate school was the right time to have children. She realized that there’s never a perfect time, but it’s always a good time. Finishing her PhD and having her first child was a big mental and emotional transition time in her life. It was a transition in family life and financial situation. Her life had major uncertainties, like what if they didn’t get those jobs? Being comfortable with uncertainty is hard, but it helps to know that plans you make are just guides. Uncertainty comes with any change in your life, but you can prepare the best you can and embrace it with excitement.